Chelsea Cereghino, of Lynchburg, Virginia, is examining rhizobia bacteria’s relationship with two legumes — clover and pea. Some of nature’s most fascinating relationships happen beneath the soil, according to one Virginia Tech undergraduate researcher. There, certain types of bacteria can attach to plant roots, consuming food in exchange for helping the plant fix its own nitrogen and ultimately grow. 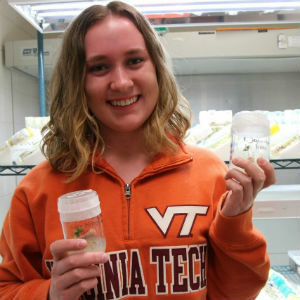 This summer, as part of the Fralin Life Science Institute’s Summer Undergraduate Research Fellowship program, Chelsea Cereghino, of Lynchburg, Virginia, is examining rhizobia bacteria’s relationship with two legumes — clover and pea. She wants to know which symbiotic relationship is stronger and yields the most growth. Understanding these relationships can help horticulturalists improve crop engineering as the demand for agricultural production increases to meet the world’s growing human population. Farmers often use fertilizers to help plants grow, but these are expensive and destructive to the environment and human health. Finding a way to make naturally occurring symbiotic relationships more efficient could be an alternative. This summer, Cereghino is monitoring the growth of 40 clover plants and 40 pea plants. Those in a symbiotic relationship with rhizobia bacteria are being observed for their efficacy at fixing nitrogen. Cereghino’s hypothesis is that she will find that the pea-bacteria relationship is strongest, because of the plant’s evolution as a larger, food-producing crop. She will present her findings at this year’s undergraduate research symposium. Virginia Tech’s 2016 Summer Undergraduate Research Symposium is July 28 from 9 a.m. to 5 p.m. in Goodwin Hall, located at 635 Prices Fork Road. Students from multiple organized summer programs will present their research in a poster format. Each program will also nominate one exemplary student or project group to present their research in a showcase oral session. The community is welcome to attend. The Office of Undergraduate Research organizes the Summer Undergraduate Research Symposium with support from the Fralin Life Science Institute and the Office of the Vice President for Research.